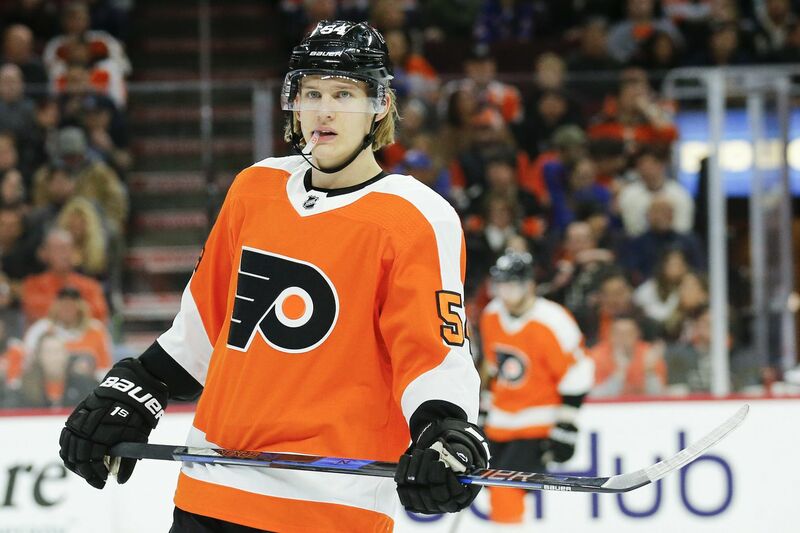 Left winger Oskar Lindblom scored more goals in Wednesday's rookie game (three) than he did in 23 games with the Flyers (two) last season. Left winger Oskar Lindblom scored a hat trick Wednesday as the Flyers defeated the New York Islanders, 6-3, in a rookie game at the Northwell Health Center in East Meadow, N.Y.
A second-period shot by defenseman Phil Myers was deflected by Lindblom for the Flyers' third power-play goal of the night, giving them a 4-3 lead. Seconds later, the Sweden native completed his hat trick. Lindblom, who had two goals in 23 games with the Flyers last season, finished with five points. Center Mikhail Vorobyev (three points) converted a turnover into a goal to put the Flyers ahead, 6-3, early in the final period. Earlier, Morgan Frost (three points) and Lindblom each had a goal and an assist in a wild first period that ended in a 3-3 tie. Frost tied it with 2.4 seconds left in the period, scoring a power-play goal on a shot that deflected off an Islanders defenseman. Carsen Twarynski also scored a first-period goal for the Flyers, who had two tallies in the first 10 seconds of a power play. Highly touted goalie Carter Hart allowed three first-period goals, then blanked the Isles in the second period — he made several point-blank saves — before being replaced by Liam Hughes in the third period. Hughes, who was flawless in the third period, is a camp invitee who played last season with Seattle in the WHL and Reading in the ECHL. It was the third straight year the Flyers and Islanders played a rookie game; the Flyers are 2-0-1 in those contests. The Flyers' main camp starts Friday morning in Voorhees, and their first exhibition game will be a Sunday matinee against the Islanders at the Nassau Coliseum.